Opening with a plea ‘to learn again the art of careful detail’, Jim Carruth’s Black Cart gathers eighteen years’ worth of finely observed poetry of the rural environment into one volume. Carruth is Glasgow’s Poet Laureate, but he is first of all a farmer’s son, brought up on a Renfrewshire dairy farm, and his latest collection draws richly on the traditions and experiences of his family and rural neighbours, celebrating the farming community’s bond with the land, while at the same time reflecting the vulnerability and hardships of this way of life. Divided into three main sections — ‘Homecoming’, ‘A Time for Giving’, and ‘Inheritance’ — the collection is underscored by epigraphs from Virgil’s Georgics, as well the names of fields, grasses, and closed-down dairy farms. Such details function as important touchstones for Carruth, in a collection which is carefully curated, deliberately linking the origins of pastoral poetry with the modern day, local and specific concerns of Ayrshire farming communities. The poems develop classical pastoral and georgic characteristics — elegies, portraits of farmers, descriptions of agricultural work, praise of the countryside, and even some didactic content, in the reported speech of rural workers. Crucially, however, Carruth’s poetry also reflects the economic and social realities of farming as a way of life under threat: the closure of dairy farms, the disastrous bovine foot-and-mouth outbreak in 2001, the competitive pricing by supermarkets that forces milk prices down, and ultimately, the sheer hard work and mental fortitude involved in making a living from the land. This is not pastoral escapism then, but an invitation to reconnection or rediscovery. What comes across above all from this collection is a deep respect for the rural environment and the people who work the land. There are no rural idylls, only working farms, and working people. Carruth’s poems reveal aspects of this way of life that are likely unknown for the average city-dwelling reader, vividly portraying real farm work: slaughtering, tagging or marking animals, ploughing fields, bundling hay bales, learning to shoot, disposing of dead livestock and burning carcasses. There is, however, no room for squeamishness or misplaced sentimentality; poet and reader must not look away out of disgust, or guilt, or fear. Death is thus an inevitable presence in these poems, but the collection is also full of life, in Carruth’s spirited portraits of the farming community, and the physicality of their work. their days sliced through with tarmacadam? ‘Far Field’ addresses more directly the philosophical question of belonging, and the implications of the bond between farmer and environment. The farmer recognises ‘the marks he’s left on this land’, the construction of walls and dykes, as well as his shaping of his herd through selective breeding and bloodlines, but all of this is also vulnerable to time, a way of being which must be maintained through hard work, or otherwise lost. Here and elsewhere in the collection, Carruth touches on the transience of life on the land, also demonstrated in the closure of the dairy farms commemorated in his poem, ‘Until the Cows Come Home’. Carruth’s careful marking of the names of farms and people throughout Black Cart speaks to a poet’s belief in the importance of naming as well as noticing, as an act of remembrance for what is lost, or perhaps as a defence against the loss of what remains, insisting: ‘I will give you names / for names are important’. The loss of belonging is keenly felt in the deaths of the older generation of farming folk, and the decline of the dairy farming economy. Thus the final section of Black Cart, ‘Inheritance’, includes a series of elegies for individuals as well as farms. Ultimately, Carruth addresses the problem of belonging through writing, connecting with the land and its traditions through poetic craft, as much as his parents were once connected through farming. As in ‘The Trouble with Ploughing’, father and son are both ‘working against the quest for a flawless line’. This turn to ecopoetics aligns Carruth with other contemporary Scottish poets whose work explores questions of ecology and belonging, such as Kathleen Jamie and John Burnside. Closing the collection with the poem ‘Inheritance’, Carruth admits ‘I’ve turned down the full embrace / of a life wedded to the land’. But still the ‘promise of belonging’ invoked in ‘Far Field’ remains: ‘my real inheritance / is the handing down of being’. In Black Cart, Carruth’s commitment to ‘careful detail’, in a modern take on pastoral infused by attentive, first-hand observation and rooted in lived experience, helps to share that crucial inheritance with his readers. 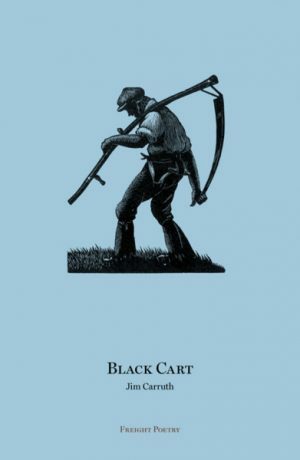 Black Cart by Jim Carruth is published by Freight Books, 2017. Louisa Gairn is the author of Ecology and Modern Scottish Literature (EUP, 2008), and a contributor to essay collections on Scottish writing, including Kathleen Jamie: Essays and Poems on Her Work (EUP, 2014) and The International Companion to Scottish Poetry (ASLS, 2016).